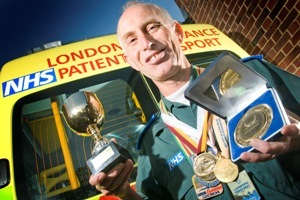 Keen runner and patient transport service ambulance person Jim Mundy smashed through the 200 marathon mark last month. 58 year old Jim, based at St Helier ambulance station, reached the milestone of a massive 200 competitive marathons in September when he finished a 26.2 mile course in the New Forest in 3 hours 40 minutes. As well as running the equivalent of London to Baghdad and back in his 200 marathons, Jim is also on course to run 52 marathons in as many weeks – something he missed out on last year when an event in Luton was cancelled.